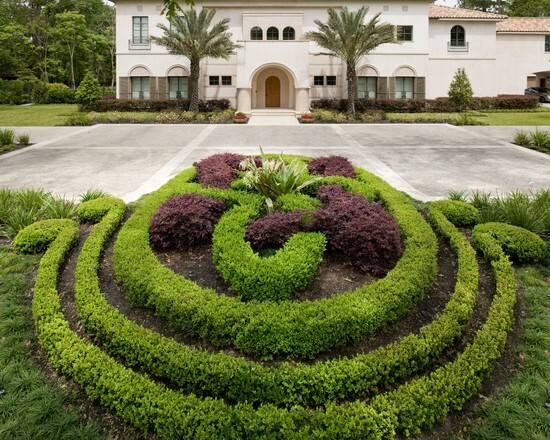 We were contacted by the owner of a Houston, Texas home who asked us to design a series of gardens and landscaping features that would compliment and expand the Mediterranean theme of his house into the surrounding landscape. This house sat on a very large lot of several acres in a secluded Memorial Drive neighborhood located near the 610 Loop. 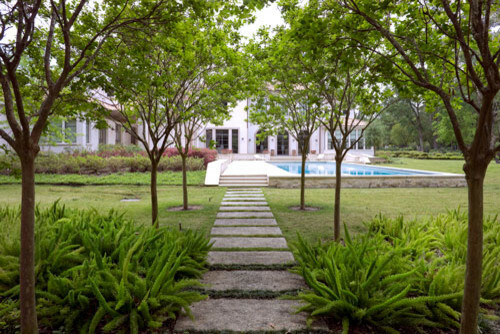 The home featured a symmetrical, linear appearance in spite of its two-story build, and our client wanted a landscape and garden design that would follow these same principles of self-contained regularity and subtle linear motion. 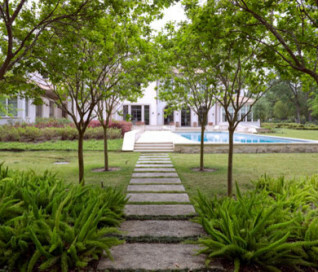 Creating a Mediterranean theme in a Houston, Texas garden and landscape is a bit more complex that it might appear at face value. The southern coast of Europe—particularly in Italy and Greece—is a mountainous area where homes and gardens are built on steep angles and sharp vertical rises. Gardens and fields are often built in terraces that climb the mountains due to the limited planting area and rough, rocky terrain. Limestone is the predominant rock type in Italy and Greece and has become iconic of this part of the world in our collective consciousness. Mediterranean homes and gardens are historically famous for their white stucco walls, olive groves, and carefully sculptured greenery embedded in a rugged limestone backdrop. 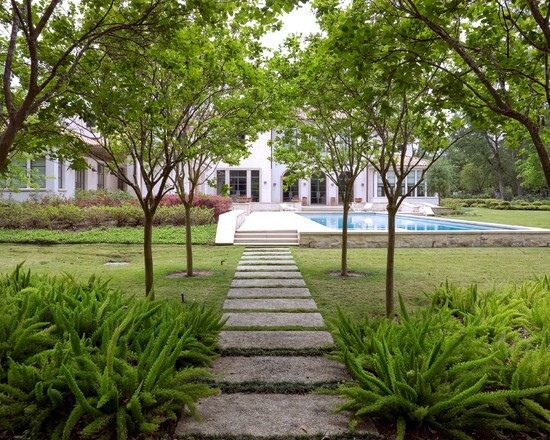 The challenge lay in taking an essentially three-dimensional landscaping style and transfering it to a Houston property. As we all know, this part of Texas is very flat, so a hillside garden is out of the question in the literal sense. However, using a combination of symmetrical forms and linear progressions, along with some innovative garden materials, we were able to mimic several aspects of seaside European terrain. The key to doing this was to establish a combination of circular forms and linear patterns in the multiple garden elements we designed. French and Italian gardens place a heavy emphasis on order and symmetry, and both tend to utilize right angles to establish form. We planted a variety of low level growth around the house and rear swimming pool patio to emphasize its walls and corners. We then added three keynote forms to the landscape to create a Houston equivalent of a Mediterranean garden. The first of these forms was a knot garden centered on the front door, located just in front of the home’s motorcourt. 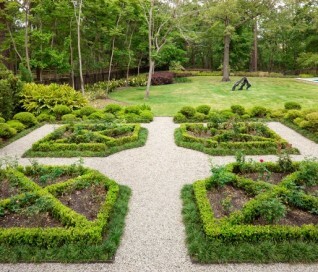 We planted boxwoods in three circular rows that looked like terraces on a hillside. 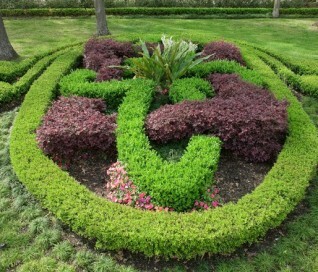 In the center of the knot garden we planted Loropatalum, punctuated with a lone Crinum lily as the center piece. The rich purple of the Loropatalum draws catches the eye, and the vertical dimension added by the lily draws it upward to the front entrance of the house. Moving then to one side of the house, we transformed a substantial portion of the yard into a parterre garden that centered on a large glass room that extended from the west wing of the house. 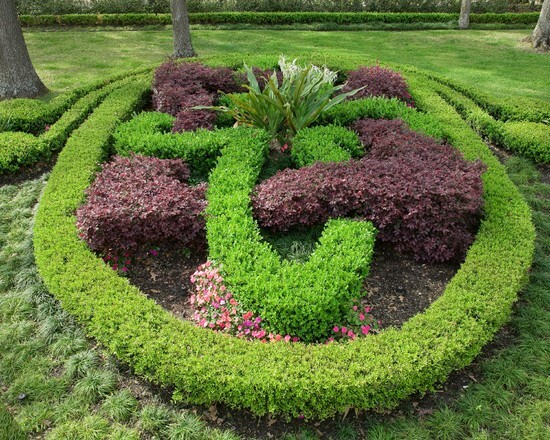 This garden was populated by low-growth rose bushes whose amenability to constant trimming makes them an ideal plant material for parterre gardens, and whose colorful blooms a made them stand out from multiple vantage points throughout this Houston neighborhood. 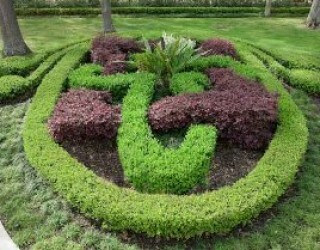 The garden borders were made from of boxwood hedges, and the central pathways were made using European limestone gravel that mimics the color of the limestone cliffs of the Aegean and Adriatic Seas. We then completed the design by adding dwarf yaupon, a small shrub that bears a curious resemblance to clouds, all along the borders of the gravel walkways. This helped create the impression that the garden was located on a hilltop near the sea, and that the clouds were rolling across the shoreline. One of the most appealing attributes of this Houston, Texas property is its superb location. The back of the yard borders a 50-foot ravine carved out of the earth by a major tributary of Buffalo Bayou. This seemed to us a natural destination spot for garden guests to visit after strolling around the west wing of the home to the pool. To encourage them to do so, we planted an alley of crepe myrtles leading from the pool area all the way back to the woods along the ravine. We then built a walkway out of limestone aggregate blocks that started at the parterre garden, ran alongside the house to the pool, then ran straight out through the alley of trees to the scenic overlook of the forest and stream below.